Post news Report RSS	Mondrian - Plastic Reality EX1.1 now Live on itch.io! Mondrian - Plastic Reality EX1.1 adds an important new feature to Mondrian Maker: the Import Button! Using the Down Arrow button on the Open screen, you can import level files into the game from anywhere on your system. This means you won't have to worry about searching desperately for the game's Levels folder, say, when it's installed through a third party service like the itch.io app or eventually Steam. 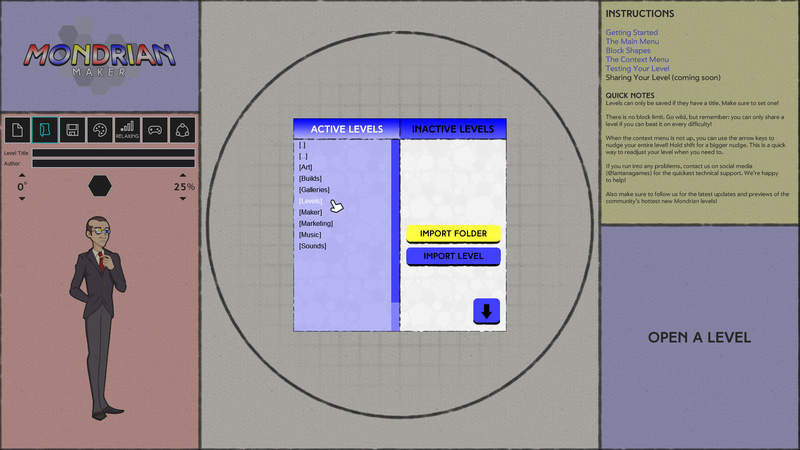 The Import Button is just the latest feature in our attempt to make the level-creatione experience in Mondrian Maker as streamlined as possible. You can import individual levels or entire folders of levels, with the option to Ignore or Overwrite levels that already exist in the game's Levels folder. Keep an eye out for even more features coming to Mondrian Maker very soon to help you have a great time creating levels for Mondrian - Plastic Reality!